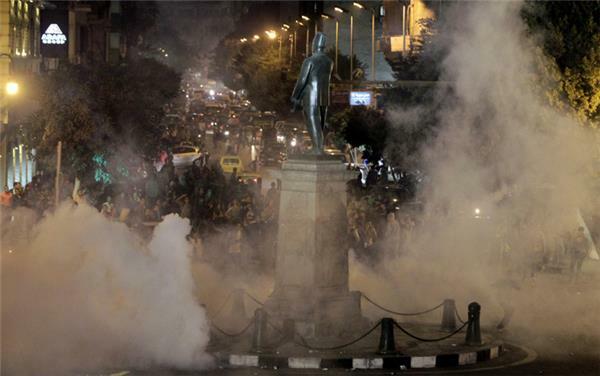 Talaat Harab square in downtown Cairo has become a flashpoint of the unrest on Tuesday night, with riot police firing tear-gas at protesters, after they took to the streets in defiance of a law passed requiring police approval for gatherings of more than 10 people. Activists also gathered to demonstrate against a new proposal to allow the military to continue trying civilians it arrests. An Al Jazeera journalist, reporting from Cairo, has said police are now firing tear-gas now and chasing protesters around Talat Harb Square close to Tahrir Square. "Protesters will not leave until detainees released," our reporter said on Tuesday. 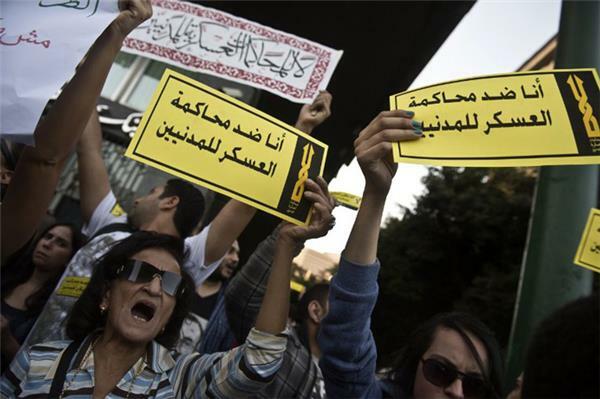 Egyptian protesters have been holding placards and shouting slogans during a demonstration organised by human rights group No Military Trials for Civilians in front of Cairo's Shura council. Riot police have been out in force during protests against the new law restricting demonstrations. Al Jazeera's Gregg Carlstrom, reporting from Cairo, said on Tuesday that some of the protesters tried to regroup in downtown Cairo, by Talaat Harb square, where police used water-cannon and tear-gas on them again. "The interior ministry says the protesters threw rocks at the police," Carlstrom said. Among the 74 people arrested were Mona Seif, founder of a campaign against military trials of civilians, and Ahmad Harara, a dentist who lost his eyes to birdshot during protests against Hosni Mubarak in 2011 and against the military junta that ruled Egypt immediately after Mubarak's fall. Egypt's interim president, Adly Mansour, has signed a restrictive new "protest law" that would require Egyptians to seek approval days in advance before organising demonstrations. - 1 year in prison and at least 30,00 le UP TO 50,00 for anyone wearing masks. The United States Secretary of State John Kerry is accusing Egypt's well-organised Muslim Brotherhood of having "stolen" the revolution that toppled longtime autocrat Hosni Mubarak in 2011. Speaking on Wednesday to leaders of multinational US firms, Kerry said the Islamist group had appropriated the revolt against Mubarak from young people who started it in large part through social media. Kerry's comments are likely to raise eyebrows in Egypt where there are competing claims of credit over Mubarak's ouster. US officials have in the past lamented that secular Mubarak foes were unable to mount a credible political option to the Brotherhood. The son of deposed President Mohamed Morsi spoke to Al Jazeera. 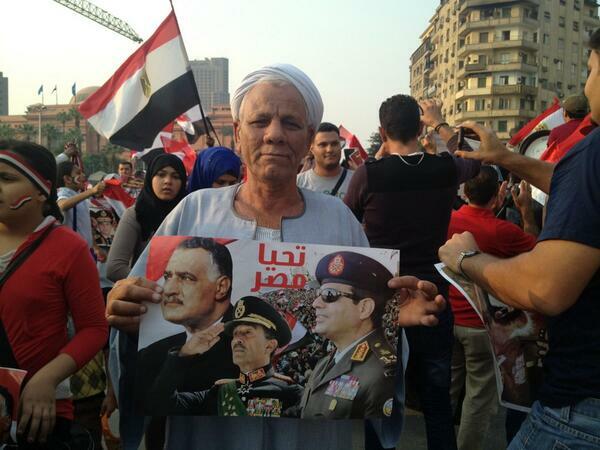 He said that Morsi's trial was "not a trial" but an "attempt to claim smartness". Listen to the full interview here. The son of deposed President Mohamed Morsi's , Osama Morsi, who says he is also Morsi's first lawyer, has spoken to Al Jazeera. nonsense and these coup procedures." "The president stand and our stand is fixed. The president is one of the revolution’s sons. We are used to such procedures. 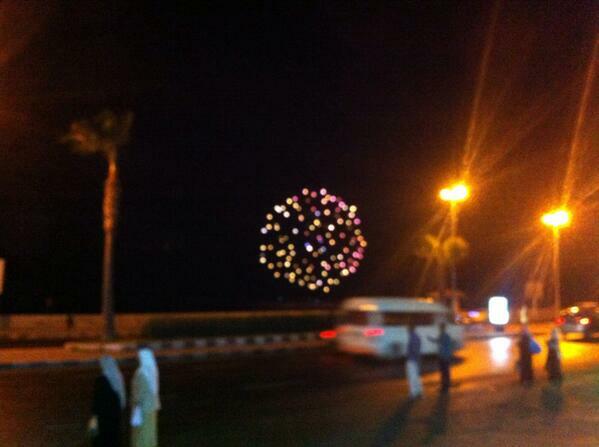 Those who lived the Mubarak era knew that what happened today is not new. It is an attempt to discipline the Egyptian people and teach them that when they vote they have to vote for those who believe in the Mubarak regime, and those who only live under the shoes of the army people." 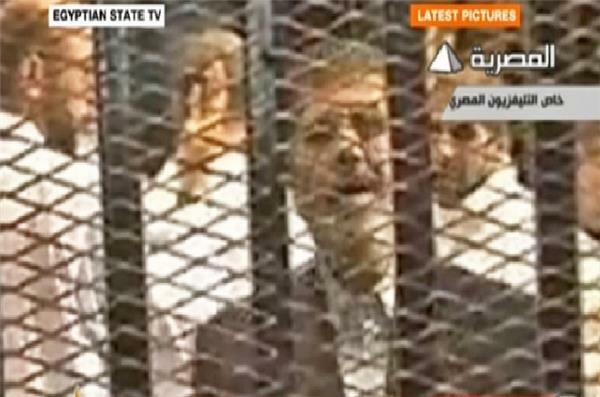 Defiant President Mohamed Morsi appears in court, in a suit rather that the white detention clothes. Gunmen attacked a security checkpoint in a city north of Cairo on Monday and killed three policemen, the interior ministry said. Egypt will impose duties on firms that export nitrogenous fertilizers without providing their share to the local market, to help secure domestic supplies, the trade and industry minister said. The decision will be immediately effective, Minister Mounir Fakhry Abdel Nour told a cabinet news conference on Monday. It is the latest of a series of populist measures announced by the Egyptian government, which hopes to make life easier for the average citizen as it charts its way through a tough political transition. 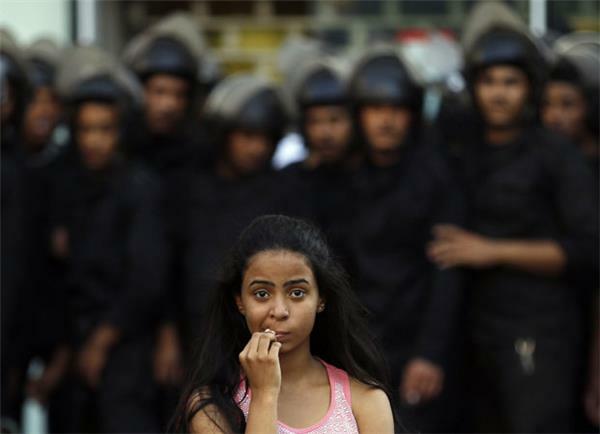 Egyptian security forces fired tear gas at handball fans who targeted them with birdshot Sunday during clashes at Cairo airport that left 11 police wounded, the interior ministry said. The clashes broke out when the fans tried to force their way into the international airport to greet the returning team of Al-Ahly handball club, the ministry said in a statement. 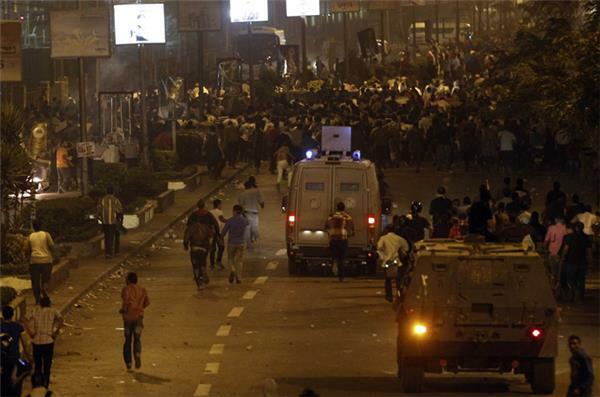 Eleven policemen were hurt, said the statement, which did not provide details on any casualties among the handball fans. arresting several, it said. The violence did not affect air traffic at the airport, a hub for travel across North Africa. Two Canadians who were barred from leaving Egypt following weeks of imprisonment without charges have returned to Canada. Filmmaker John Greyson and physician Tarek Loubani left Cairo on a flight on Friday morning and were warmly greeted by family and friends when they landed in Toronto. "We're delighted to be here, to be free," Loubani said. 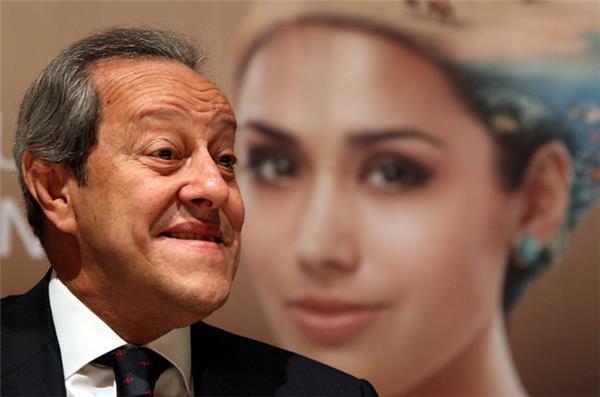 Egypt lifted a travel ban for the two on Thursday. The pair weren't allowed to board a plane after they were released from jail on Sunday. Protesters are still on the streets, breaking curfew. Al Jazeera's correspondent in Cairo, who we are not naming for security reasons, says Cairo's demonstration is the most visible in Egypt today. He confirmed, though, that there have been skirmishes between anti-coup protesters in other cities, including Alexandria. "But these were separated by the police and there were no serious reports of casualties." Egypt criticised on Thursday a US decision to curtail military and economic aid to Cairo after a crackdown on the Muslim Brotherhood, although Washington stressed it was not severing ties with its long-standing ally. The army-backed government insisted Egypt would not bow to US pressure, saying it found the decision strange at a time when the country was "facing a war against terrorism". However, US Secretary of State John Kerry said Washington would consider resuming some of the aid "on a basis of performance" in following the interim government's "roadmap" that promises to lead to fair elections. Egypt's foreign ministry said on Thursday a travel ban has been lifted for two Canadians who were barred from leaving Egypt following several weeks of imprisonment without charge. Badr Abdel-Atty, Egypt's foreign ministry spokesman, said the pair has been cleared to leave Egypt "within hours". "The prosecutor general has informed us that they are free to leave the country after the accusations against them were dropped," Abdel-Atty told The Associated Press said. He said the prosecutor has ended the interrogation with the Canadians and has decided to cross their name out from the list of those banned from traveling. Israel hopes the US decision to cut aid to Egypt will not affect the two countries' historic peace deal, a Cabinet minister said on Thursday, insisting that Israeli-Egyptian ties remain as close as ever. Gilad Erdan, the minister responsible for civil defence, said Israel and Egypt are continuing to cooperate in military and political spheres and that there is "constant contact" between the two countries. The minister spoke just hours after the United States announced it was cutting hundreds of millions of dollars in aid to Egypt in response to the Egyptian military's ouster last summer of the nation's first freely elected president and a subsequent crackdown on protesters. But participants in the solemn vigil were divided about criticising the military over the deaths, a sign of shifting attitudes since the army's ouster of President Mohamed Morsi in July. 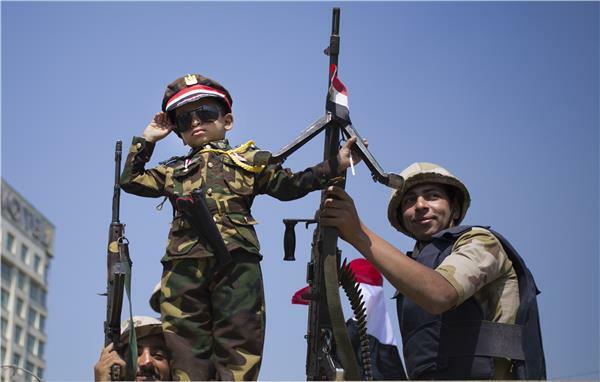 The more belligerent chanted "down with military rule", and some even called for the execution of former army chief Field Marshal Hussein Tantawi, hoisting aloft pictures of him and other now-retired generals they blame for the deaths. One laid a picture of Tantawi on the street for cars to drive over it. 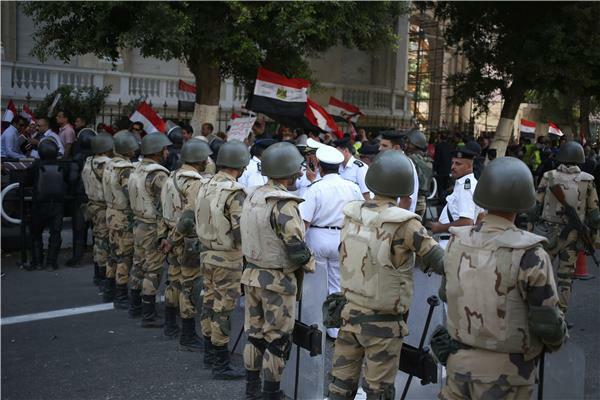 Other demonstrators rejected the anti-military chants, describing the army as a savior for its overthrow of Morsi after demonstrations demanding his resignation. The trial of Egypt's deposed Islamist president Mohamed Morsi on charges of inciting the murder of protesters will start on November 4, the official MENA news agency reported Wednesday. Morsi will stand trial with 14 other defendants over the killings of protesters outside his presidential palace in December 2012, almost six months before his ouster in a military coup. Egypt's powerful army chief has left open the possibility of running for president in elections due next year, according to excerpts of an interview with the newspaper al-Masry al-Youm published Tuesday. Since the July 3 coup that removed President Mohamed Morsi, there have been growing calls from the military's supporters for General Abdel-Fattah el-Sisi to run to replace him. 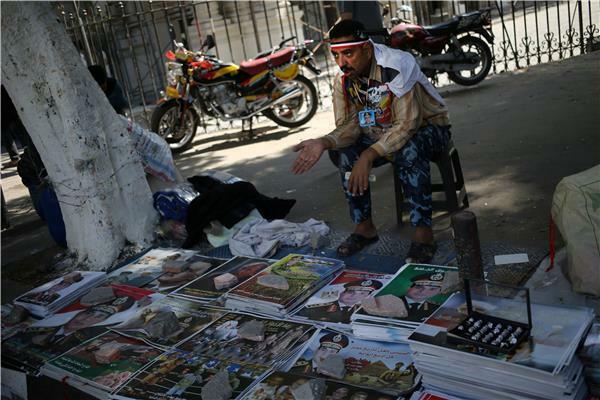 Previously, a military spokesman denied el-Sisi had political ambitions. The interview was the general's first direct comment on the issue. "I think the time is inappropriate to raise this question in light of the challenges and risks that the country is going through," he said when asked if he would run, according to excerpts posted on the newspaper's website. He said attention must not be distracted from carrying out "the map for the future" for a post-Morsi transition, "which will create a new reality that is hard to evaluate now". A panel of Egyptian judges has recommended the dissolution of the Muslim Brotherhood's political party, a move that signals a widening crackdown on the group. The judges' recommendation Monday said the party represents an outlawed group. The recommendations will be delivered to a Cairo court reviewing a case demanding the party's dissolution on October 19. The Brotherhood's party was registered in 2011, months after the ouster of President Hosni Mubarak _ the first time the 85-year old organization formed a political party. It went on to win a majority in the first post-Mubarak parliament, and its leader, Mohammed Morsi, later won office as Egypt's first democratically elected leader. 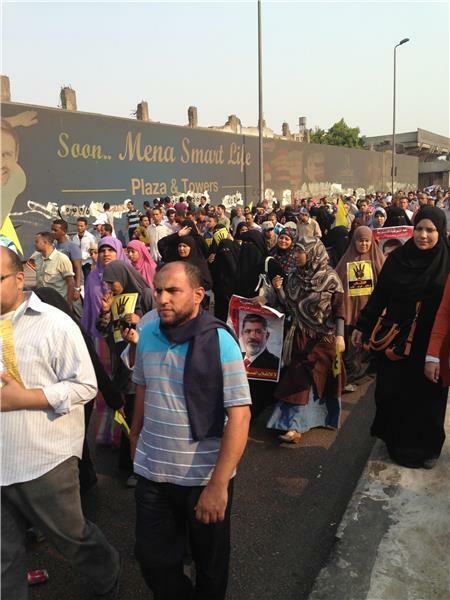 Morsi was ousted in a popularly backed military coup in July. 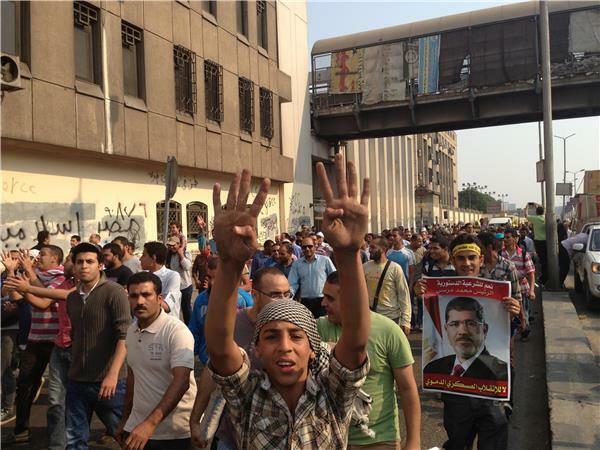 Authorities have since arrested Brotherhood leaders and cracked down on its protests. The Health Ministry has said that the death toll from today's clashes across the country has reached 51 and injured 268. Armoured personnel carriers had fired rubber bullets and tear gas at members of the Muslim Brotherhood and supporters of ousted Egyptian President Mohamed Morsi during clashes along a road at Ramses square, which leads to Tahrir Square in Cairo. "I agree that there a very serious human rights violations under the new order." Juan Cole on Al Jazeera. "The security sources really had a handle on where people were coming from and was able to stop them." "People on the ground report local people joining with security forces to try and stop them [the protesters]." Our special correspondent in Cairo. Of the 28 dead across the country, two deaths are thought to have happened in Dokki, and seven more in Ramsis, where some conflict is still ongoing. Our correspondent says that while many thousands came out to celebrate the October 6 anniversary, the government sees it as an indication of people supporting their legitimacy. 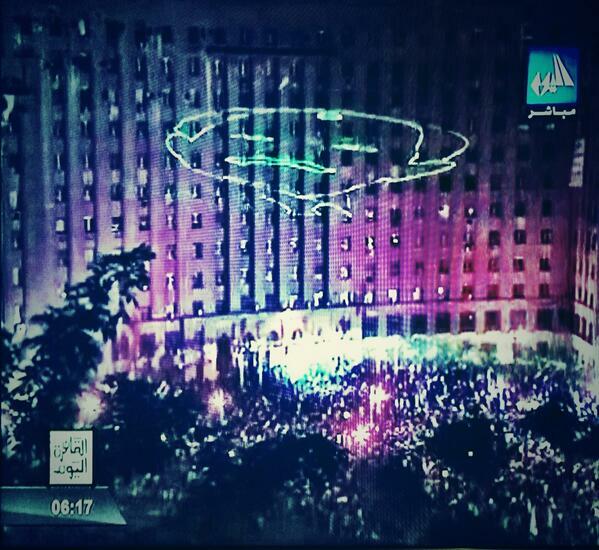 Images of the October 6 celebrations are being shared on social media. 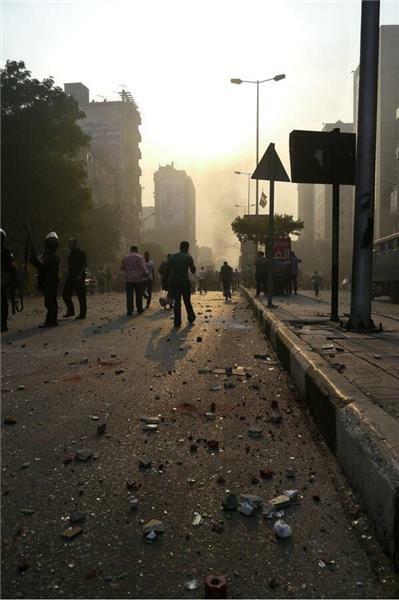 Some violence is still going in in certain areas of Cairo. 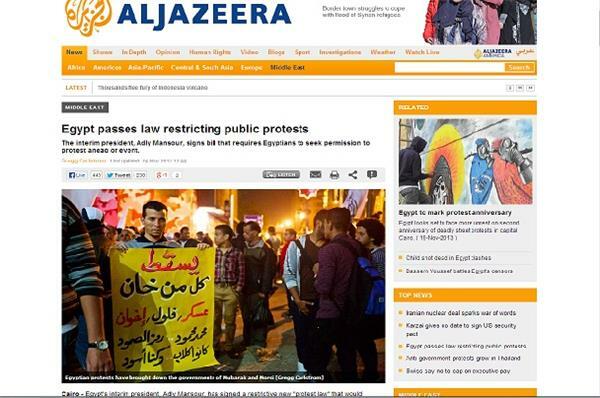 Reuters news agency is reporting the death toll in today's clashes has reached 28. These figures come from the state news agency, quoting the Health Ministry. This video, broadcast by the Rassd News Network, reportedly shows security forces and men in plain clothes firing towards protesters. The footage, published on YouTube today, apparently comes from today's demonstrations in Ramsis, Cairo. Our correspondent in Tahrir Square says the celebrations, which have been going on throughout the day despite violence elsewhere, are starting to wind down. She also reports some activity in the Dokki area but that demonstrators are not engaging with the security forces. 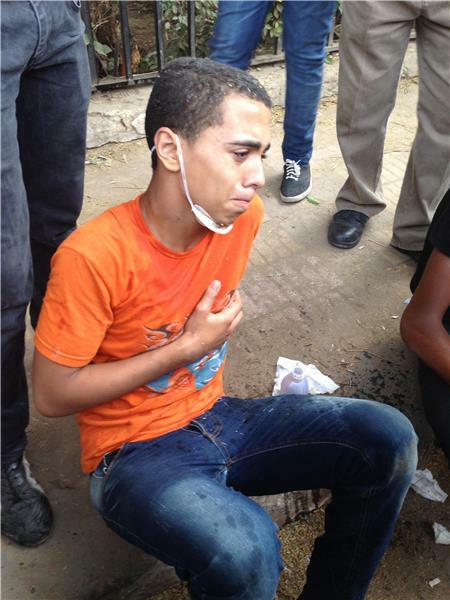 Our correspondent, who spent the day trying to get in to Tahrir Square with demonstrators. 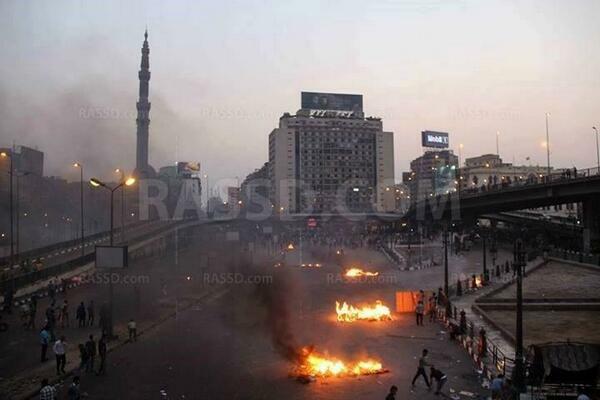 He says it is believed Ramsis Square is the only place that clashes are ongoing. "It seems that the other protests have melted away." The curfew this evening does not come in to play until midnight, so people will be able to remain on the streets for some time. This day is one usually reserved for prayers and celebration. Today, three separate anti-coup protest marches have been trying to get to Tahrir Square but have been hampered by tear gas. Our correspondent says that there is a determination among the marchers that they have as much right to be in Tahrir Square as those who support the military. There were people injured as they ran away, there is a suspicion birdshot was used by security forces. Our correspondent is reporting thousands of military supporters turning out in Tahrir Square to mark the anniversary of the October War, passing through three layers of security to gain entry. 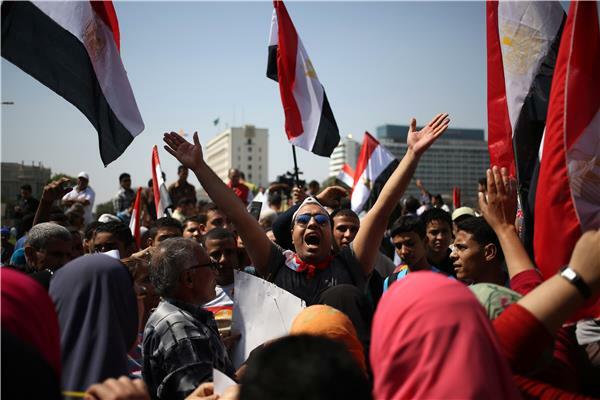 Another correspondent, who is with those marching in opposition of military rule, said the numbers of demonstrators grew as the came closer to Tahrir Square to about 4,000. The marchers were met about 1.5km from the square by security forces who fired teargas and rounds in to the air to push the crowds back. The anniversary of the October War has long been used for political gain in Egypt. More images sent in from our correspondents on the ground here, showing protests as they make their way towards Tahrir Square. The military and its supporters are out today to celebrate the 40th anniversary of the October War. Egyptian fighter jets staged celebratory flights over Cairo on Sunday, ushering in a commemoration of the 40th anniversary of the nation's last war with Israel. Violence has already broken out between security forces and anti-military demonstrators.